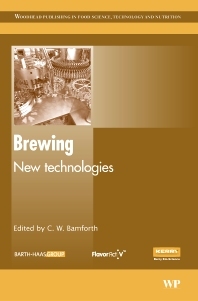 New brewing technologies: Setting the scene; Providing cereals for brewing; Developments in the supply of adjunct materials for brewing; Malt and malt products; The breeding of hops; The processing of hops; Yeast genetics in brewing: New insights and opportunities; Yeast supply and propagation in brewing; Water in brewing; The brewhouse; Fermentation of beer; Accelerated processing of beer; Filtration and stabilization of beer; Packaging of beer; Modern brewery sanitation; Waste handling in the brewing industry; Quality assurance in brewing; Brewing control systems: Chemical analysis; Brewing control systems: Microbiological analysis; Brewing control systems: Sensory evaluation; The future of brewing. Brewing continues to be one of the most competitive and innovative sectors in the food and drink industry. This important book summarises the major recent technological changes in brewing and their impact on product range and quality. The first group of chapters review improvements in ingredients, including cereals, adjuncts, malt and hops, as well as ways of optimising the use of water. The following sequence of chapters discuss developments in particular technologies from fermentation and accelerated processing to filtration and stabilisation processes as well as packaging. A final series of chapters analyse improvements in safety and quality control, covering such topics as modern brewery sanitation, waste handling, quality assurance schemes, and control systems responsible for chemical, microbiological and sensory analysis. With its distinguished editor and international team of contributors, Brewing: new technologies is a standard reference for R&D and Quality Assurance managers in the brewing industry. Dr Charles Bamforth is Anheuser-Busch Endowed Professor of Brewing Science at the University of California. He is also Visiting Professor of Brewing at Heriot-Watt University in Scotland and a Fellow of the Institute of Brewing. Professor Bamforth was formerly Head of Research at Brewing Research International.